Cloud watching has been a favorite past time of kids for ages. We see them floating by, some fluffy, some wispy, and others dark and stormy. 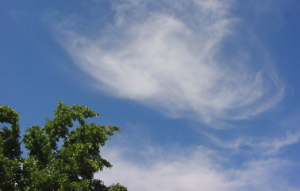 Why don’t clouds fall from the sky? Watch this PBS video- Why Do Clouds Stay Up. You will find the answer to the question “Why don’t clouds fall from the sky” and you will gather fun information about these big, fluffy piles of water vapor that live overhead. Take this quiz after watching this video to show what you learned!